The Heroic Physique inspires power, hope and confidence. For as long as man has been walking this earth, he has aspired to be at his greatest. Instincts tells us to strive to be balanced mentally, spiritually, and physically. Having control of all three will give you self- assuredness, well being and happiness. Although we know this, very few of us live to our full potential. The ideal human form, broad shoulders, a massive chest and arms and a tapered waist is synonymous with superheroes and heroic characters. Heroes have always looked this way whether they were drawn in the comics or on the big screen. As a young man I remember looking up to the heroes in the movies,TV shows and comic books and dreaming of having that kind of physique. I was a teenager in the the eighties. A time when the fitness scene was exploding and the heroes in the media had never been bigger or more ripped. Heroic Physiques hadn't been this much in the spotlight since the days of Steve Reeves in the fifties. Arnold Schwarzenegger and Sylvester Stallone set a new standard. But was this realistic? Could this type of physique be obtainable by anyone? Could I achieve this too? Despite how difficult it seemed, I became determined to achieve the Heroic Physique. The first book I read on bodybuilding was by Lou Ferrigno. He was playing The Hulk on TV at the time and he was the closest guy to a being a real superhero. It was a great book but it did not compare to Arnold Schwarzenegger's Arnold's: The Education of a Bodybuilder. As a kid I read this book 14 times. I still find this to be the best and most inspiring book on bodybuilding. Another book I find to be one of the greatest books on the subject is, Building a Physique the Natural Way by Steve Reeves. Steve Reeves is a great example of the classic heroic physique. He was able to achieve it without the advancements that we have today. Although I looked up to guys like Steve Reeves, Lou Ferrigno and Sylvester Stallone for their physiques, Arnold Schwarzenegger was who I looked up to the most. He was considered at the time to be the best built man in the world and his physique looked the way I wanted to look, massive, rugged and heroic. He also seemed to care about doing good as much as looking good, which I also admired. I was six foot one, the same height as him. Arnold became my hero. After I saw him in the move Conan the Barbarian, I was inspired to really get the heroic physique. I began building my physique the old fashioned way, long hours of intence training and heavy weight. Heavy weight set a foundation for the beginner and there is no better way to achieve thick looking mass. I would later incorporate machines but my early years of training was all about free weights. I loved heavy weight and the idea of being the strongest guy in the gym. I was really into using the same weight if not more than the steroid guys were using. At fifteen years old, already starting to show some mass. At sixteen, flexing after a savage weight training routine with workout partners Greg Slowick and Eric Chmielecki, Rocky Hill Connecticut. I learned from Arnold that your mind is as an important part of your training as everything else. Your body does the work but your mind has to let that work do what it is supposed to become muscle. Your mind has to be saying" I am creating muscle, my muscle is growing. My phsique is lean and becoming one solid muscle". Always say these kinds of things to yourself. You have to motivate yourself while you train and become in a relaxed state. Health: You have to stay fit if you want to be around awhile. Confidence: Exercise not only builds muscle, it builds confidence. If you lack it, you need it. Strength: The stronger you are the more you can do! Fortitude: Do you want to be the one who gives out first or the one who makes it till the end? I entered the world of bodybuilding, I couldn't get enough. 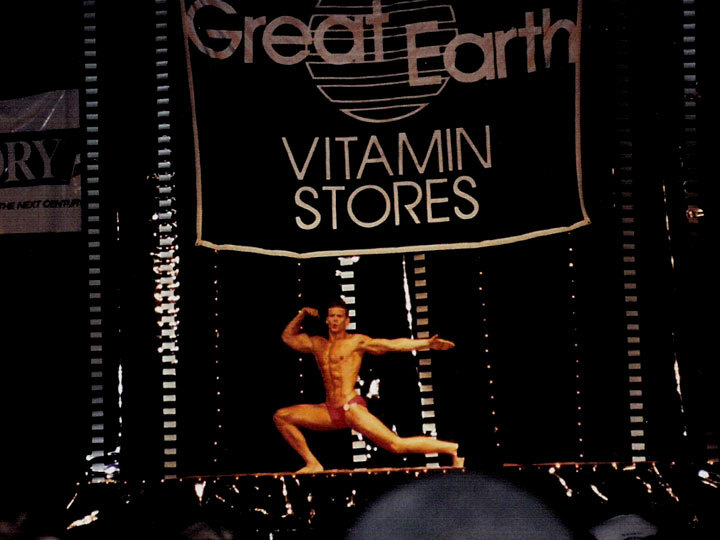 I competed in my first bodybuilding contest when I was 19. My teenage competitors were talking openly about what steroids they were on. I felt good beating some of them, but only came in third. The pressures of steroids in bodybuilding were great and I was afraid to take the risks. Bodybuilding was a great way to learn about building the heroic physique but it did not define the heroic physique. My Dad and I went into World Gym and Joe Gold was behind the counter. He was a legend himself, for starting Gold's gym. He let my dad and I work out for free. A few minutes later Sylvester Stallone walked in. The magazines stated that he was being trained by Franco Columbo for the film Rambo. Franco came in but only talked to Stallone a little bit, then he went off to train by himself. I observed him closely. He was training like he did in the movies. Intence with not a lot of resting in between sets. I was stunned when he asked me if I could give him a spot for behind the neck pulldowns. I still don't know if he asked me because I was a wide eyed kid and he wanted to give me a great story, or if he really needed a spot. Either way it was awesome. That was a work out I'll never forget. ​Wide shoulders and small hips are the classic standard of the heroic physique on the stage of bodybuilding, in comics and in our culture since the days of the early greek athletes. However in reality not every man or woman is capable of these attributes. In other words your given what you get. If everyone were to take a picture of their bone structure and placed them on an X-ray table. Some of those bone structures will have an advantage. Some will have a long clavicle and a small pelvis. Others will have the opposite. For the latter achieving the heroic physique will be more challenging. For more of The Heroic Physique hit back soon! Warning: There is a saying that goes, "Work it off in the gym." if you are training angry or for vengeance it can lead to disastrous results. When you focus on negativity it can draw negative energy to you. In the gym this can mean serious injury. Always train with a positive purpose! *Always Check with your physician before starting any exercise routine. * Stretch properly to loosen up before doing any exercises, especially before using heavy weight. The older you are the more warm up time you will need. * Warm up properly before hitting the weights. Start off slowly!! * Do the hardest exercise first. I call these Power Exercises. They are the hardest to do and produce the best results. * Use free weights if you want your muscles to look rock solid and strong. I would recommend free weights to the machines. They give you a more rugged look than the machines give you. Picking them up, carrying them around also builds joint strength and balance. * Always finish. Finishing is extremely important. If you go into an exercise program, you had better do everything you set out to do, even if the last few reps or sets are just going through the motions. It’s good discipline, and you won't have any regrets after the workout. * Stomach and calves daily. These body parts do not need the time to recover as major body parts do and can be worked daily. I never use heavy weight when training stomach. You don’t want to build up the muscle in your abdominals, or you will look thick in the waist. I do leg raises and twists with the pole for stomach and sometimes sit ups. Stomach and abs can be worked every day. They don’t need the healing time like the major body parts, and you should increase the repetitions when working them. * Train hard. If I am not sore the next day, I feel the workout was a waste of time. I feel lucky because I have always loved working out. I started when I was 14 years old and have not missed more than a week since that first day in the gym. The feeling of getting under heavy weight and then controlling it always gave me a spiritual lift. In my opinion, there is no greater feeling than being fit and carrying lots of muscle.